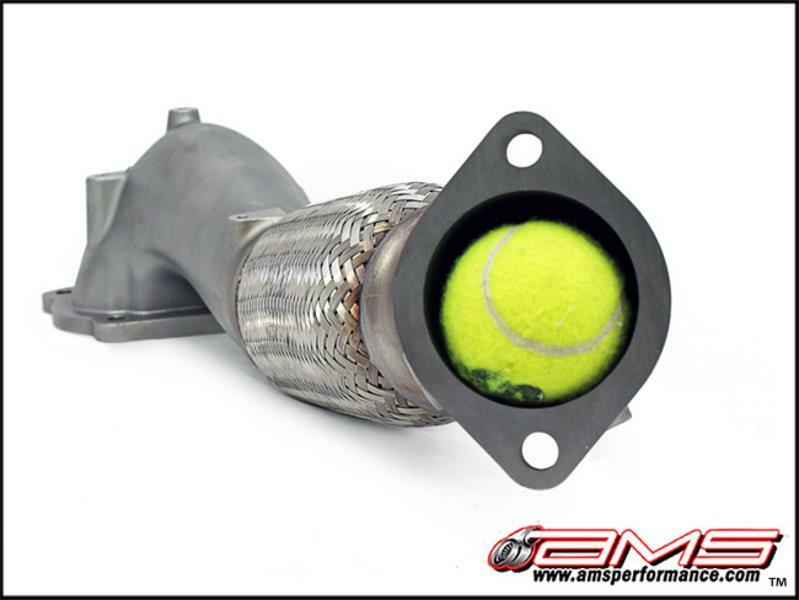 The AMS “Widemouth” Downpipe is the most power producing and well designed downpipe on the market. After months of development and testing we have created the best flowing downpipe possible. Using a CAD designed cast o2 housing we were able to obtain every angle we wanted for maximum flow and perfect fitment. The turbine outlet on the stock turbo is a cast piece with a rather complex geometry. It hugs the back of the turbo pretty tightly and has a small diameter outlet, necking down to around 2.25” before it enters the actual downpipe. The discharge from the turbo’s internal wastegate is introduced right at the point where the exhaust flow exits the turbine and the entire gas flow is then forced to make a tight turn all in a small area. This creates a lot of turbulence and if the exhaust gas volume is increased by running other power increasing mods, this juncture is an area where a lot of backpressure will be created. Due to the space constraints, it is real hard to design a low backpressure fabricated tubular part to fit in the area allowed that is actually better than stock. 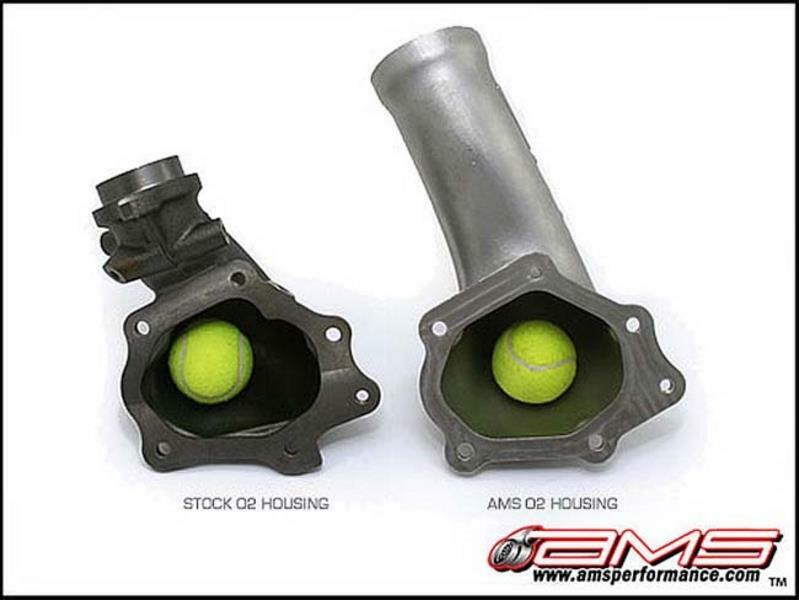 By making the turbine outlet section a casting, we were able to maximize the tight space allowed for your O2 housing and downpipe. By using three dimensions to make a higher volume, straighter path from the turbine housing to the downpipe itself we achieved the best exhaust flow and power increases without sacrifice. 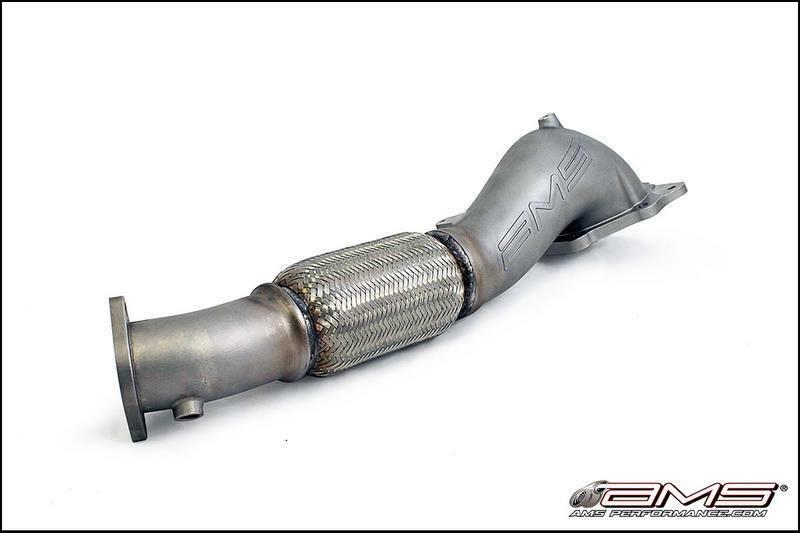 This downpipe provides more than enough flow for anything from stock to the biggest upgraded turbos available making it the last one you will ever have to buy! Unlike the competition, our downpipe is completely made of 304 cast stainless steel, including the flex section and flanges, for rock-solid durability. No thin, cheap tubing that can crack over time from engine movement and give you headaches down the road. Precise fitment makes for ease of installation and we provide all of the gaskets and hardware needed. We even incorporated a bung for a wideband gauge with a plug included.